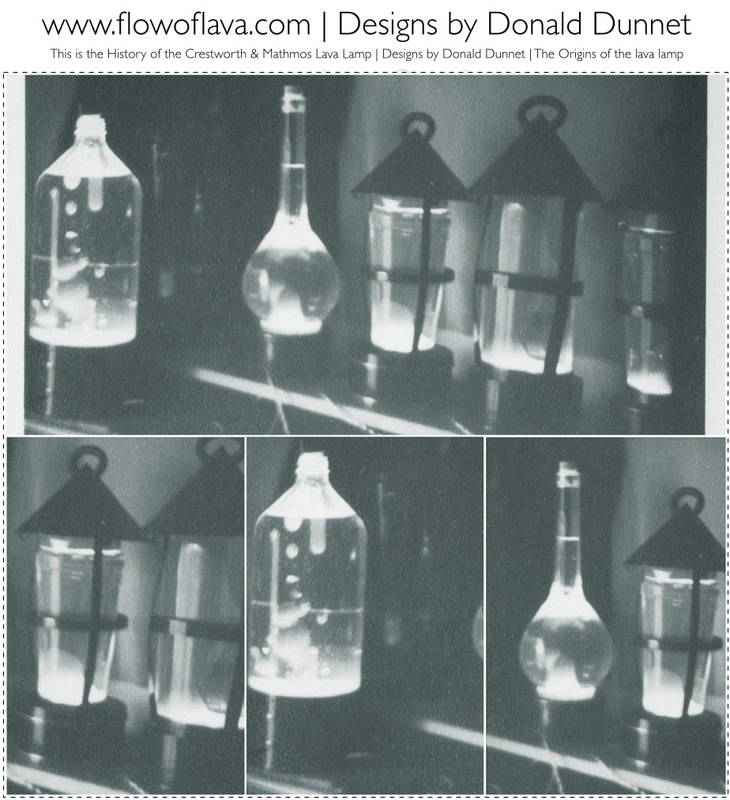 The fudamental basis of the lava lamp is two liquids moving within themselves and this in itself was a totally new concept in lighting that formed the basis of the invention of the lava lamp. Never before had anyone thought that illuminated liquids, that were powered by heat could be mixed to form a lamp. A name which is often credited as being the inspiration behind Edward Craven Walker's introduction of the Astro lamp is Donald Dunnet, but very little is actually known about him as he sadly passed away. 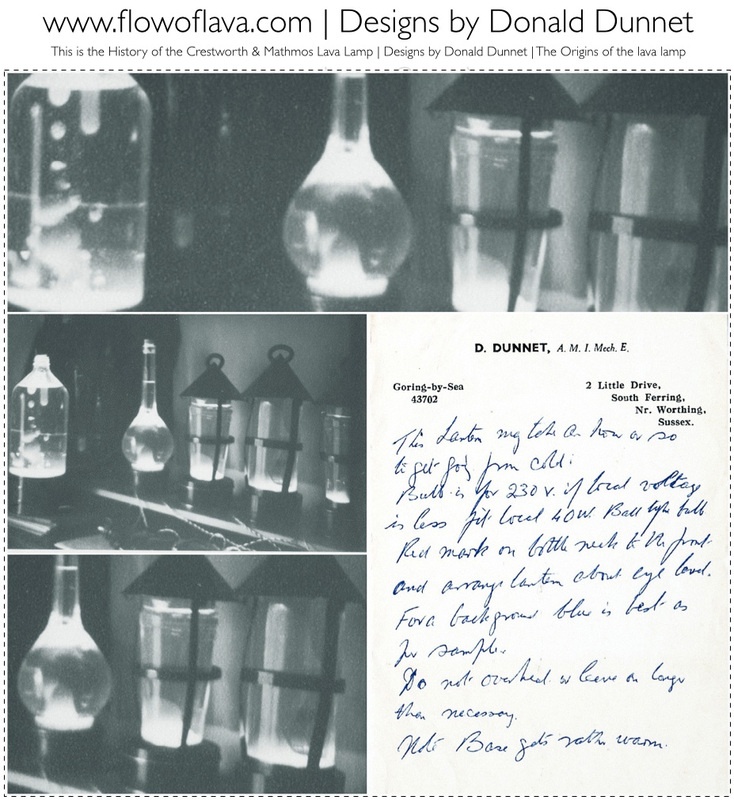 In fact in early Astro lava lamps, an instruction sheet and paperwork were included inside every box which details his invention and the inspiration behind the Astro lamp. 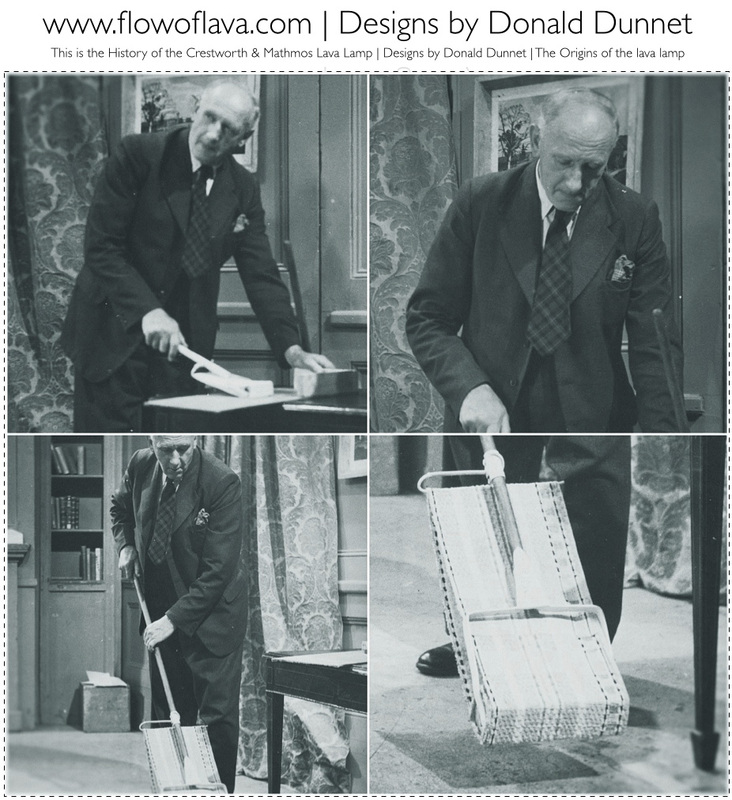 Donald Dunnet was an engineer based in Goring-by-Sea, Sussex and his patented inventions were diverse. His registered address as seen on patent information is 10, Ballards Green, Burgh Heath, Surrey. Amongst his many inventions was a unique invention for a "A display device using liquid bubbles in another liquid ", dating to 1954. This interesting patent which features a bottle with a light bulb concealed behind the bottle. The full details of the patent can be found below. 703,924. Changing display devices. DUNNET. Dec. 20, 1951 [Dec. 21, 1950], No. 31114/50. Class 3(1) A display device comprises an upper layer' of liquid 2 and a lower layer of liquid 3 in a transparent container 1, the two liquids being non-miscible and the upper layer being of lower specific gravity than the lower layer and means 9 for heating the lower layer so that it rises through the upper layer in the form of liquid bubbles or as a liquid column which breaks into such bubbles, the bubbles being cooled by the upper layer so that they return to the lower layer. The container wall has a dark coloured area 7 near its base which absorbs heat from a lamp which forms the heating means so as to heat the liquid 3. Bubbles then rise through the liquid 2 from an aperture 5 between the top of a sloping plate 4 and the wall of the container. When the bubbles eventually fall they pass through an aperture 6 between the lower end of the plate 4 and the container wall. A light coloured reflecting layer 8 is provided in the wall of the container above the heat absorbing layer 7. The container and lamp stand on a heat insulating base 12 and heat and light from the lamp are concentrated on the container by a reflector 10. The liquid 3 contrasts in colour with the liquid 2. A detergent may be added to the liquid 3 to assist bubble formation and a solute to the liquid 3 to adjust its specific gravity. This page also displays a photograph of Donald Dunnet's workshop of which you can see a test bench of his early designs. 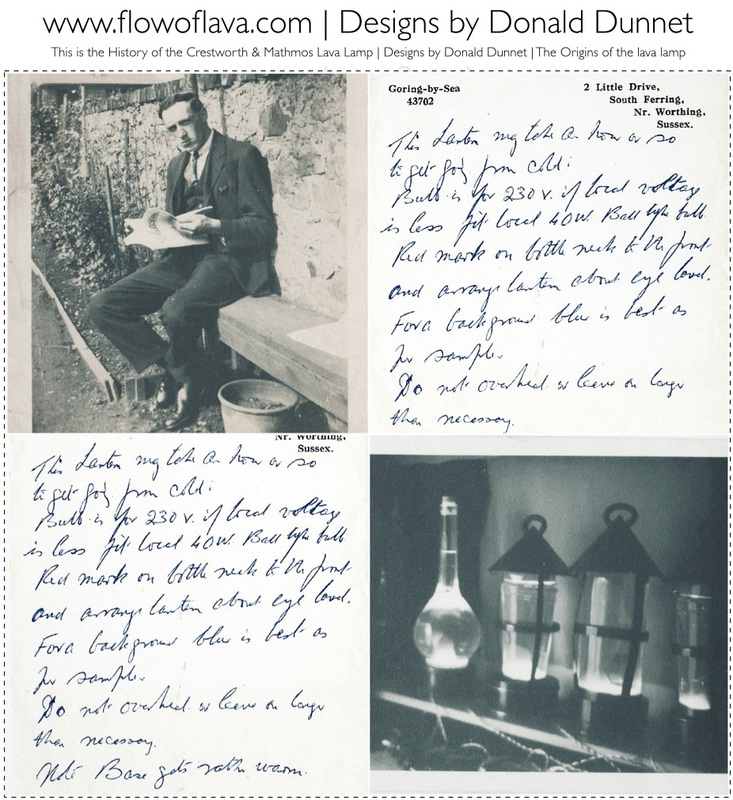 Donald Dunnet was simply years ahead of his time, but he was the first to experiment with liquids in this form, where a base liquid would rise, flow up, break and then fall back down. Sadly Donald Dunnet did not get to see his invention to mass market as he passed away. 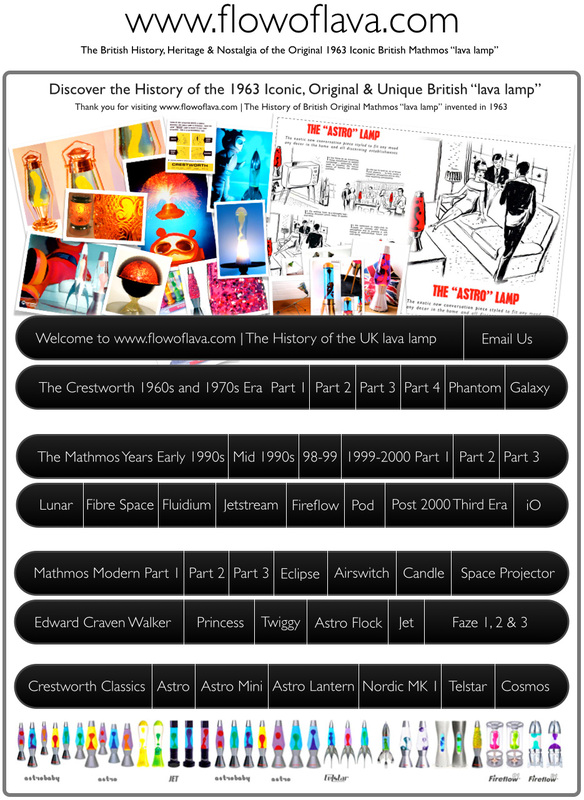 Craven Walker's vision, belief in the product, the brilliant minds at Crestworth, saw that the Astro lamp was created. It is endearing that Donald Dunnet's designs were powered by a 40w bulb which for decades until the switch over to halogen has powered the Astro lamp. 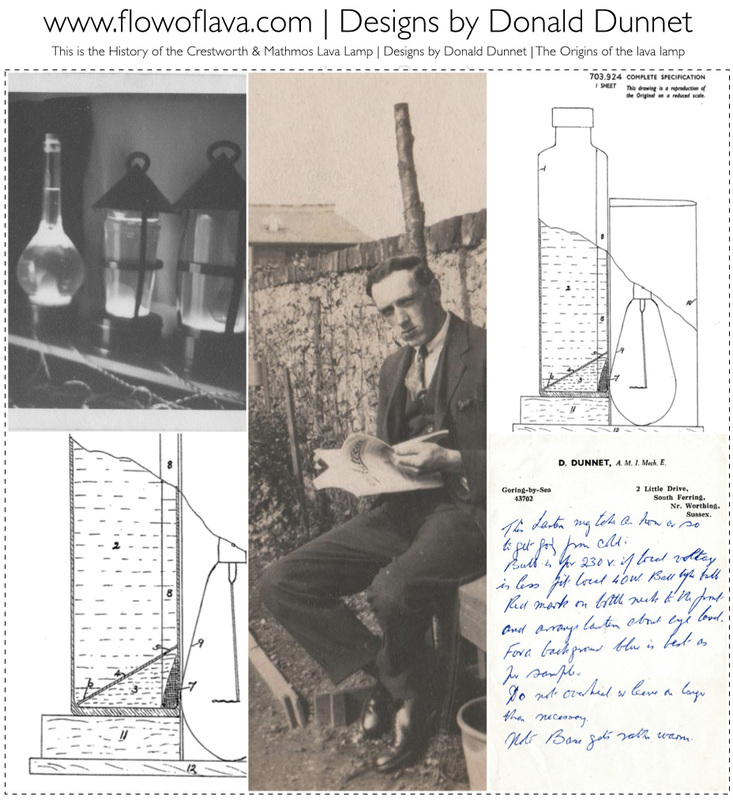 We will leave you with some images of Donald Dunnet and his inventions. www.flowoflava.com would like to thank Charlie Leverett for the images of Donald's designs. 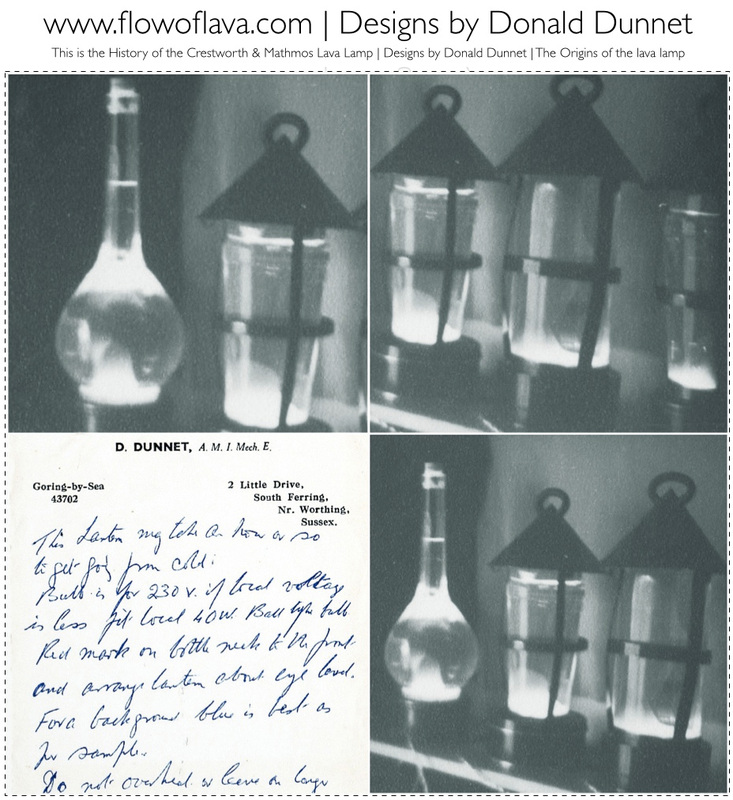 Below, one can see a photograph of Donald Dunnet's workshop of which you can see a test bench of his early designs. 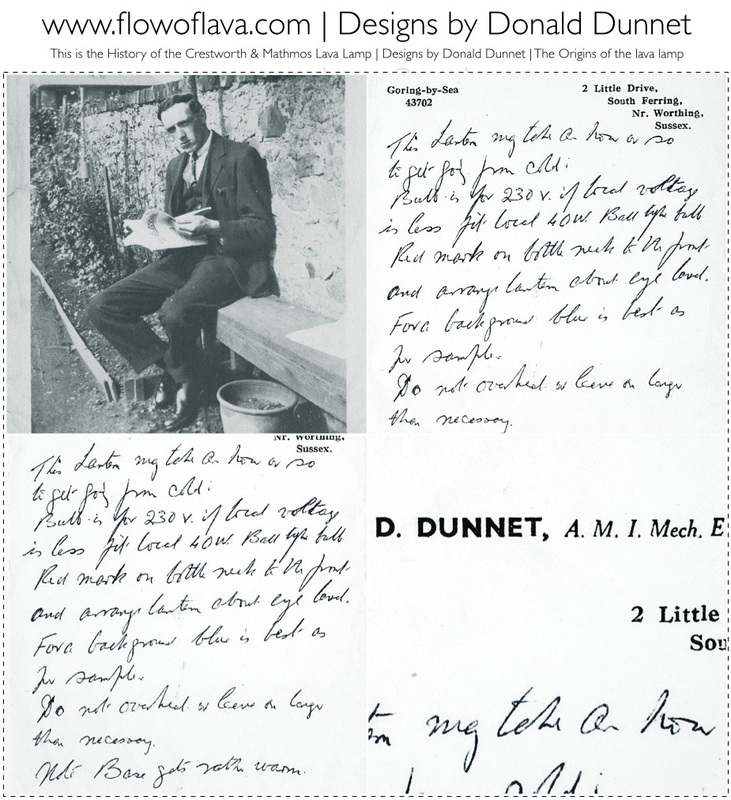 Donald Dunnet was simply years ahead of his time, but he was the first to experiment with liquids in this form, where a base liquid would rise, flow up, break and then fall back down. Below: Donald Dunnet was an engineer based in Goring-by-Sea, Sussex and his patented inventions were diverse. His registered address as seen on patent information: 10, Ballards Green, Burgh Heath, Surrey. Amongst his many inventions was a unique invention for a "A display device using liquid bubbles in another liquid", dating to 1954. This interesting patent which features a bottle with a light bulb concealed behind the bottle. The full details of the patent can be found below. 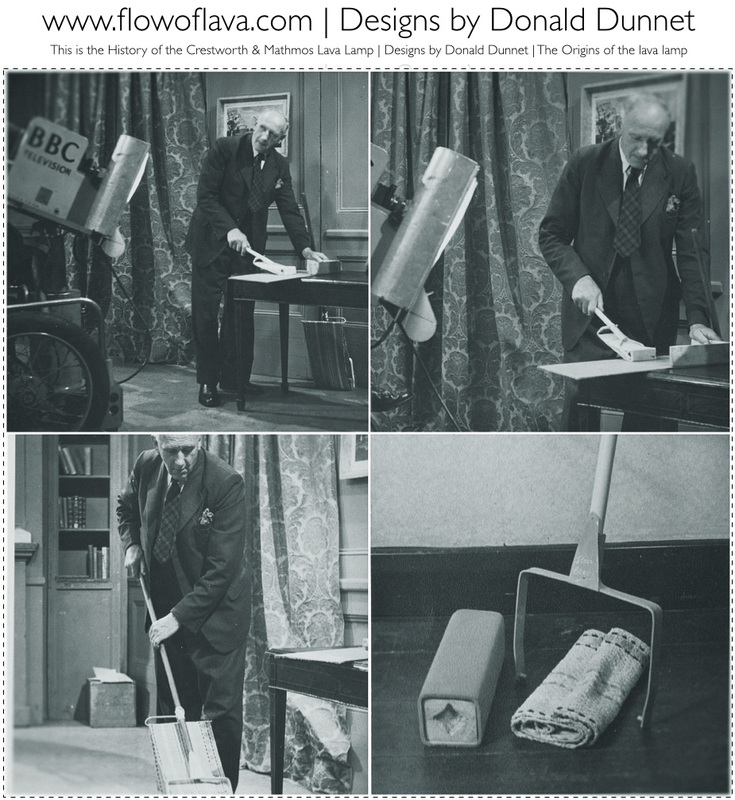 Below, one can see Donald Dunnet presenting an invention on BBC Television.